Architectural Iron Designs is dedicated to delivering stunning pieces of metal artwork for both indoor and outdoor use. Our metal forgings represent the best of both worlds that depicts traditional and contemporary artwork. Over the past 24 years, our expertise is unsurpassed in all forms of ornamental steel and metal work. 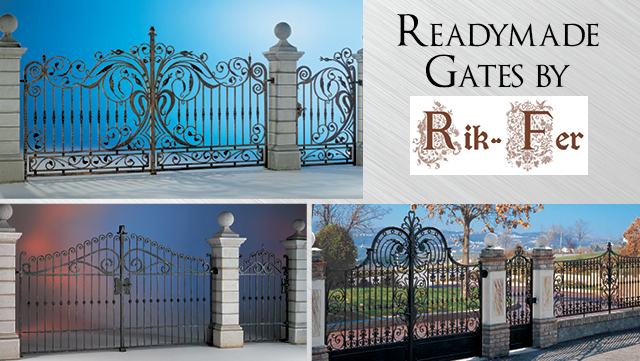 We take pride in our exclusive collection of architectural metal designs that are crafted with precision and detail from premier manufacturers in Europe, including Grande Forge, RikFer, and Indital. 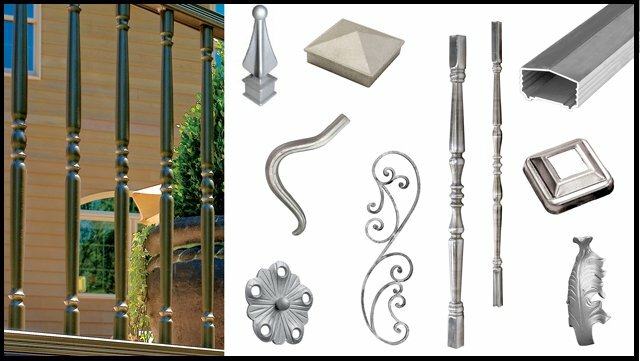 Today, we lead the industry by providing our customers numerous unique options for architectural iron collections such as railings, panels and more. We have a strong passion for gate hardware too, and you can find our cantilever sliding gate hardware, that offers an easy installation solution without compromising the beauty of your sliding gates, at duragates.com. Also, get your hands on our vast collection of gate locks, latches, hinges, gate automation systems and other high-quality products to cater to your gate hardware needs, about which you can learn more at lock4gates.com. At AIDI, we bring you exceptional quality of ornamental metal products that can embellish your space with its smooth and sleek look. To capture and preserve the look of your ironwork, use our premium metal finishes, which include Sculpt Nouveau patinas and sealers, and our own Vinylast paint. 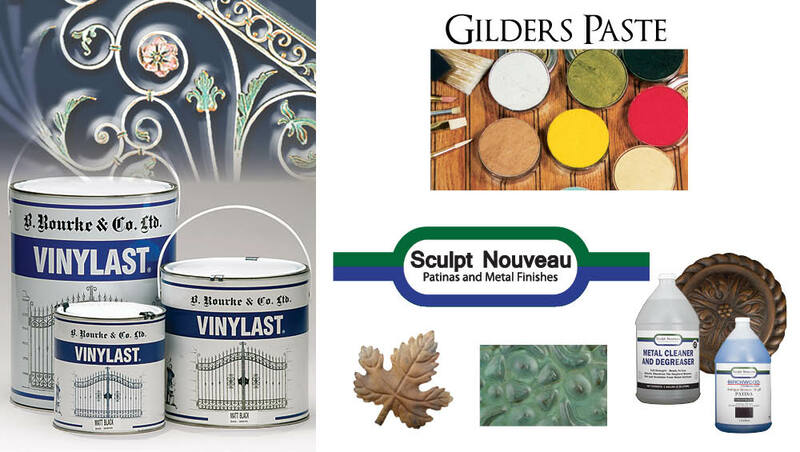 Create lasting impressions with our products that are robust and easy to maintain. 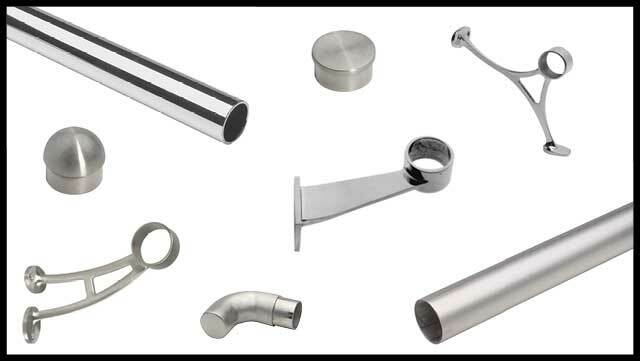 Whether building a brass handrail or a brass railing with pickets, our brass handrail fittings offer flexibility in design and style. 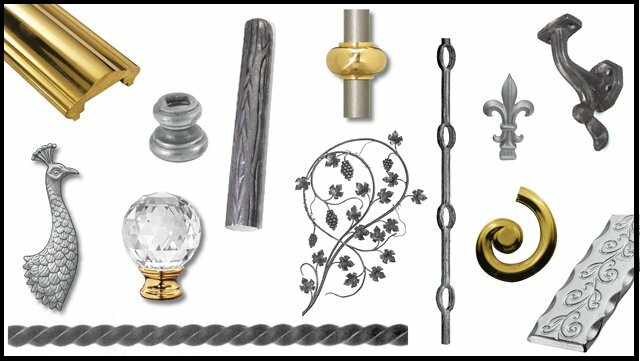 Choose from our exclusive collection of brass handrails, tubing, handrail brackets, post pockets, flanges, end caps, ball fittings and more. 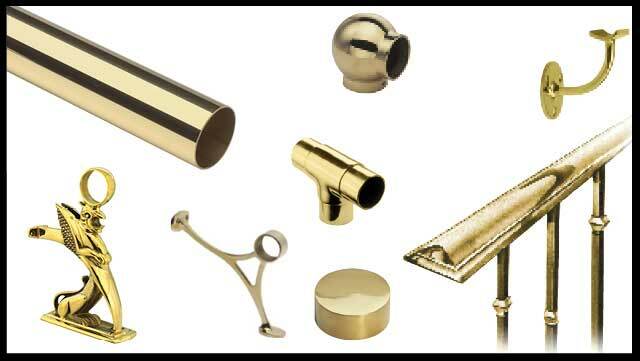 These brass components can be used on a standard staircase as well as on a custom spiral staircase. Beauty and strength are both keys to building a beautiful staircase, and that is exactly what you will get here! 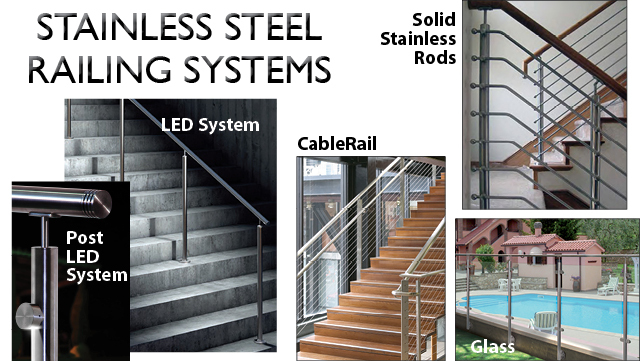 Our innovative modular stainless-steel systems offer a complete solution that can be customized by combining components to meet design preferences and construction challenges. We offer extensive baluster railing system options that complement a variety of infill options with round or smooth forms. The beauty of glass is timeless. When teamed with high-quality architectural metals, the result can be stunning. 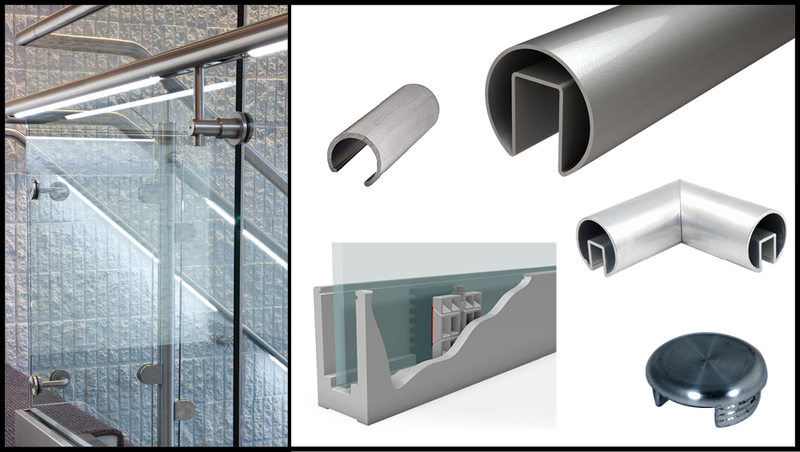 Used for both residential and commercial applications, our glass railing systems allow one to showcase the grandeur, rather than hiding it. 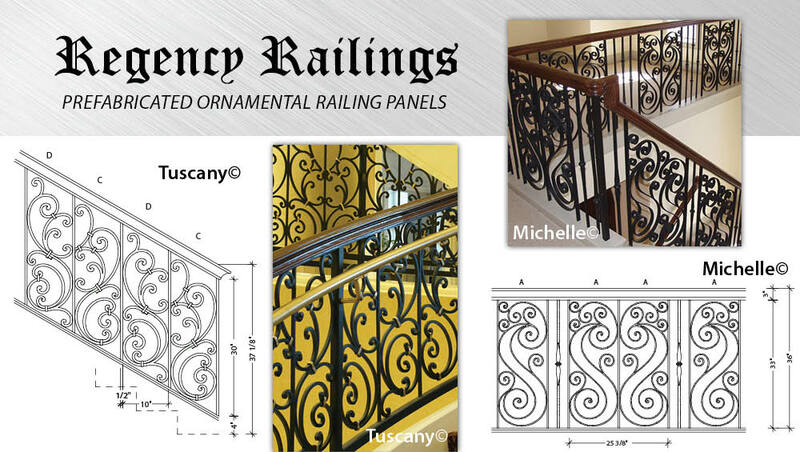 Ornamental, prefabricated railing panels from Regency Railings are perfect for staircases and balconies. 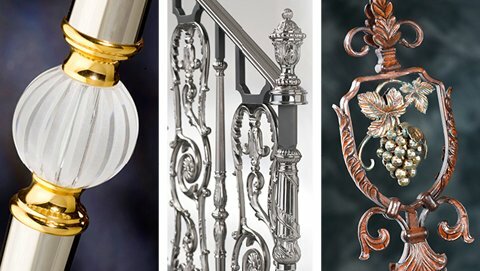 These hand forged decorative ironwork components feature ornamental iron railing panels that provide a custom look for any interior stair railing at an affordable cost. This prefabricated and patented series by Regency is all about innovation that is expressly for home builders and wood stair companies. Duragates offers a superior solution over traditional sliding gates!